Good or bad news travels fast and wide online, representing an opportunity or a nightmare for a client. Acting fast, and having a considered plan in place to manage these occurrences can mitigate, but can’t be expected to deal with every contingency. Social media is particularly fraught and can with the best of intentions actually become the source of the problem. Bad news stories are invariably placed online,within very high domain authority news sites and often rank high for brand or related terms within the Search Engine Results Page (SERP). Planning ahead, if the client has had a consistent approach to search, that should mitigate the risk of bad news flooding the SERP for brand searches. Additionally, with the assets in place, Pay Per Click (PPC) can be used reactively to good effect. 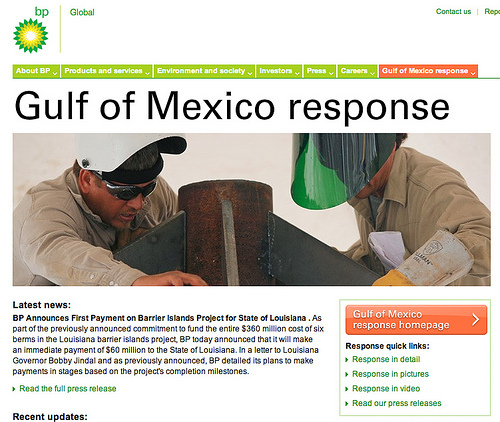 For example, BP in 2010 (Deepwater Horizon crisis) targeted ‘negative’ keywords – crisis, leak, spill and oil, on broad match (all versions of oil+spill etc). Despite the media costs involved, (costs increased from $57k to $3.6m per month), it ensured a consistent corporate response was put forward over the adverse media reporting dominating the SERPs worldwide. At the other end of the scale, PPC used cost effectively and creatively to highlight good news stories, driving traffic to specific landing pages, and ensuring that any search instigated off the back of offline PR is able to connect to the online content, and the client. It’s not likely that the competition will be high on your brand name searches (not always! ), and getting creative with killer adcopy, maximising your SERP real estate (site links will further push organic listings down the page), and maximising the opportunity to influence searchers with your message. A PR agency is perhaps best placed to to strike the right tone, be it a corporate message, apology, announcement etc, where a search agency is best placed to manage the placement, budgets, measurement and tools available to implement.